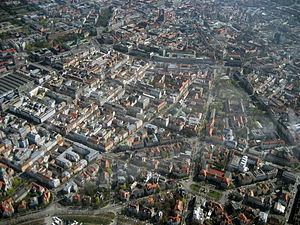 Ludwigsvorstadt-Isarvorstadt is the name of the second district (Bezirk 2) of Munich comprising the neighborhoods of Isarvorstadt and Ludwigsvorstadt. It is located directly adjacent to the historic city center to the south. The area of Ludwigsvorstadt-Isarvorstadt roughly is bound by the Isar river to the east, the Südring railtracks to the south and west, and the main railtracks, Altstadtring circular road, and Zweibrückenstraße to the north. This guide also describes some points of interest located in the Schwanthalerhöhe district, directly to the West of Ludwigsvorstadt-Isarvorstadt. Isarvorstadt is a very vibrant residential area with lots of bars, pubs, and clubs, around the beautiful Gärtnerplatz square. On warm summer evenings this square is a very popular location among young folks to gather, drink a few local beers, and generally enjoy life. Isarvorstadt is also the focal point of the gay and lesbian community in Munich. Deutsches Museum, the world's biggest museum of science and technology, is located on an island in the Isar, which also is part of the neighborhood. Ludwigsvorstadt consists of Munich Central Station and the adjacent area to the south of the station, where a lot of hotels, hostels, international diners, casinos, and sexshops are located. Immigrants from over 150 countries make this district one of the most buzzing and international areas of Munich. Some streets are extremly Middle Eastern, leading to the locals sometimes refering to this quarter as "Little Istanbul". This area is a really good place to try Arabic or Turkish food. Restaurants and cafés with good Middle Eastern food are virtually everywhere around here, in Schwanthalerstraße you can also find Verdi, a huge Turkish supermarket. Last but not least Theresienwiese, the site of the infamous Oktoberfest (Wiesn in the local Bavarian language), is located in Ludwigsvorstadt. Schwanthalerhöhe to the west of Theresienwiese comprises a mix of mostly residential parts and a few industrial facilities, like the huge Augustiner brewery. Munich Central Station 48.140311.55981 Hauptbahnhof is located in the area. It has direct connections to almost every bigger city in Germany and also some international services. S-Bahn lines S1, S2, S3, S4, S6, S7, S8, and S27 all run along the northern boundary of the area with stops at Donnersbergerbrücke, Hackerbrücke, Munich Central Station, Karlsplatz (Stachus), and Isartor. S-Bahn lines S7, S20, and S27 also serve the stop Heimeranplatz in the south-west of Schwanthalerhöhe. Subway lines U1 , U2 and U7 run from Munich Central Station in eastern direction and stop at Sendlinger Tor and Fraunhoferstraße. Subway lines U4 and U5 run from Munich Central Station in western direction and stop at Theresienwiese (for the Oktoberfest) and Heimeranplatz. Subway lines U3 and U6 run from Marienplatz through the center of the area to stop at Sendlinger Tor, Goetheplatz, and Poccistraße. Tram lines 18 and 19 run from western Munich along Bayerstraße through the length of the northern part of the area to the Isar river with many stops along the way. While line 18 continues to follow Altstadtrinf through the area all the way, line 19 branches off at Karlsplatz (Stachus) to run through the historic city center. Tram lines 16 and 17, coming from Neuhausen-Nymphenburg and Maxvorstadt have their first stops in the area at Munich Central Station and Karlsplatz (Stachus). They run along Altstadtring until line 17 branches off to the south-east at Müllerstraße to have its final stop in the area at Fraunhoferstraße, while line 16 goes on to the north-east to serve the stops at Isartor and Deutsches Museum and go on to Haidhausen. The main arteries serving the area are Lindwurmstraße from the south from autobahns A 95 and A 96, Landsberger Straße/Bayerstraße from the west from autobahn A 8 and A 99, and Altstadtring circular road from the east and north. However, it is generally not advisable to go to the area by car. Though traffic isn't too heavy outside rush hours, you will have a hard time finding a parking spot. There is only one bigger parking garage close to the central station. Otherwise, street parking is only allowed to residents with a special parking permit. As Ludwigsvorstadt-Isarvorstadt is very bike-friendly, with bikeways along almost every larger street and generally not too much traffic, going by bike is probably the fastest way to get to the area. There are a large number of bike rentals around the city. Given that the area is rather centrally located just south of the historic city center, it is easily accessible by foot. From Marienplatz, just walk south for a few minutes and you will get to Sendlinger Tor on the northern edge of the area. Given the compact size of the area, the easiest way to get around is on foot. From the center of the area at Müllerstraße everything is located within 500 m. Like most parts of Munich the area is very bike-friendly. With bike lanes running along most of the bigger streets and generally low traffic on other roads, it is a very fast and pleasant way to explore these neighborhoods. The biggest hazard while going by bicycle are tram rail tracks running on the streets - if you manage to get into one with your tire you should brace yourself for getting off your bike the hard way. Another valid option, especially if you desire to go to the more western parts beyond Theresienwiese, is going by Tram 18, which crosses the full extent of Ludwigsvorstadt-Isarvorstadt from east to west. Deutsches Museum on an Isar river island. Internal pole dynamo and a full scale ship on display. 48.1329811.543242 Verkehrszentrum, Am Bavariapark 5. The division of Deutsches Museum devoted entirely to all kinds of means of transportation. It is housed in the former halls of the Münchner Messe (Munich's trade fairs), dating back to early 1900s. 48.127211.5653 Old South Cemetery (Alter Südfriedhof), Thalkirchner Straße 17 (U-Bahn U1, U2, U3, U6, U7: Sendlinger Tor). The Old South Cemetery was established in 1563 as plague cemetery. From 1788 to 1868 is was Munich's single collective burial ground - making it the last resting-place for many famous Munich residents of that time, like Josef von Fraunhofer, Friedrich von Gärtner, Leo von Klenze, Justus von Liebig, Georg Simon Ohm, Carl Spitzweg, and the 1100 victims of the massacre of Sendling's Night of Murder (Sendlinger Mordweihnacht) of 1705 with artistic gravestones and crypts. Today, the cemetery is a protected area and a local recreation area. 48.12688311.5736564 St. Maxmilian's church (St. Maximiliankirche), Auenstraße 1 (U-Bahn U1, U2, U7: Fraunhoferstraße), ☎ +49 89 2024070. The Roman Catholic church was built at the beginning of the 20th century in the Romaneque Revival style as the first church in the Isarvorstadt district. Its location right at the shore of the Isar river makes it a very prominent structure. The church gets is fame mostly from its unorthodox pastor, who used to serve beer at the Oktoberfest and owns two pubs in the neighborhood. 48.13700611.5530645 St. Paul's church (Paulskirche), St.-Pauls-Platz 10 (U-Bahn U4, U5: Theresienwiese), ☎ +49 89 531547. Daily 08:00-20:00 (no sightseeing during services). The Roman Catholic St. Paul's church is the second largest church in Munich. Its 97 m (318 ft) high bell tower can be accessed for a stunning view of Munich and the Alps. Free of charge. 48.13055611.5458336 Statue of Bavaria and Hall of Fame, Theresienhöhe 16 (U-Bahn U4, U5: Theresienwiese), ☎ +49 89 290671. Apr-15 Oct: daily 09:00-18:00, during Oktoberfest 09:00-20:00, closed from 15 Oct-Mar. The 19 m (62 ft) high statue is the personification of the Bavarian homeland. You can climb up to the viewing platform inside the head. During Oktoberfest you can get a great view of the fair. The Hall of Fame at the back of the statue is a pantheon to celebrated Bavarians (the Hall of Fame is closed during Oktoberfest). Adults €3.50, Concessions €2.50. 48.132511.5491671 Oktoberfest, Theresienwiese (U-Bahn: U4,U5 Theresienwiese). In late September Munich resounds to this famous festival, the world's largest beer festival. It usually lasts 16 days, to end on the first Sunday in October. In 2019 it runs from Sat 21 Sept to Sun 6 Oct, and in 2020 from Sat 19 Sept to Sun 4 Oct - dates are set for ten years ahead. The festival is extended by a day or two whenever German National Unity Day on 3 Oct (a public holiday celebrating the merger of East and West Germany) falls just after the normal Sunday closing. That next happens in 2022, 2023 then 2028. The first Oktoberfest took place on 12 Oct 1810, to celebrate the marriage of Prince Ludwig of Bavaria and Princess Therese of Sachsen-Hildburghausen. All citizens of Munich were invited to a meadow (Wiesn) situated in front of the city tower, subsequently renamed Theresienwiese in honour of the bride. In the early years of the fair, horse races were held, then as the event grew, they added agricultural conventions, which still take place every fourth year. In 1896, businessmen working with the breweries in Munich built the first giant beer tents, and drinking beer has been the primary focus ever since. Although it's still dubbed Oktoberfest, the festival was soon moved to start in September for a better chance of decent outdoor weather. There are some 24 large tents (ie capacity circa 10,000, mostly but not all under cover) presided over by the major breweries, and a similar number of small tents seating a few hundred apiece. Each tent serves its brewery's own beer, with incredibly strong barmaids hoisting ten or more huge Maß ('Mass') one-litre glasses of beer - those glasses are heavy even when empty! Musicians lead the crowd in popular drinking songs, and there's food. And of course toilets, with hordes of drunken people jostling to get in. There's at least one wine tent, carnival games, amusement rides, and other entertainment. In 2012, Oktoberfest hosted 6.4 million visitors who drank 6.9 million litres of beer and ate the equivalent of roughly 90 oxen, 400,000 sausages and 600,000 chickens. Recent years have been similar, so the average visitor consumes little more than a litre of beer (and a measly one-twelfth of a sausage) - hardly a debauch, though that covers a big individual variation, and then there's "pre-loading". Book well ahead with accommodation, and even so, expect to pay double. Everything decent will sell out, even mid-week, and even in nearby towns such as Augsburg. Budget air tickets and Sparpreis rail tickets will also be hard to find. If you know which brewery's product you prefer and which days you want to come, consider reserving a place online on that brewery tent's website. Don't bring small children at weekends. Each Tuesday from 12 to 6 pm is family day with discounts on many rides. Children aren't allowed in beer tents after 8 pm. Don't bring a backpack, or any bag larger than 3 litres. All bags will be checked at the Wiesn entrance, and acceptable small bags tagged. You'll have to leave larger bags at the nearby left-luggage lockers, for a fee, and probably involving a queue. Walk there if possible. The closest underground station "Theresienwiese" (lines U4 and U5) gets horribly crowded and is sometimes closed to avoid dangerous congestion. An alternative is "Goetheplatz" (lines U3 and U6) - also crowded, but at least you'll be able to breathe, and the exiting crowd will carry you willy-nilly to the Wiesn gates. There's no entrance fee for the Wiesn site or the individual tents, but of course you'll be paying for drinks, food and amusement - reckon €10 for a litre of beer. You can buy beer tokens in advance. Wiesn opens at 9 am. Individual beer tents open at 10 am midweek and serve beer from noon. They open at 9 am on weekends and serve all day (except the opening Saturday, the tapping day or "Anstich", with the first beer keg ceremonially broached at noon). They will only admit as many people as they have seating, then they're full. Midweek they're often full by early afternoon, weekends by late morning. If you leave the tent for any reason, you're unlikely to get back in. Smoking is forbidden within the tents. Some tents have designated smoking areas outside. The bar usually stops serving at 10:30 pm. Make sure you finish your beer by 11:30 pm, when the tent closes and security will briskly eject all stragglers. Outside the tents, there's lots to eat, drink and do. You'll have a good time, but you won't get the full-on, oompah-oompah, wow-only-in-Munich experience. You're welcome to buy a beer mug, don't try to nick one. Security at the exit will search for that very thing and each year they confiscate over 100,000. They'll probably just scowl and send you on your way, but being accused of theft is never a good place to be. Not in Germany. In 2017 the Wiesn lost property office had reports of 1300 passports, 600 wallets, 520 iphones, 325 pairs of glasses and 360 keys - that's a lot of ruined trips. 48.13222911.5515682 Tollwood Winter Festival (Wintertollwood), Schwanthalerstraße 13 (U-Bahn: U4,U5 Theresienwiese), ☎ +49 89 3838 500, +49 700 3838 5024 (tickets for individual events), e-mail: info@tollwood.de. 23 Nov–31 Dec. This five weeks long festival combines ethnic food, souvenir shops, concerts and theater and it is very popular among the locals. Free admission. 48.13644311.5527333 Climb St. Paul's bell tower, St.-Pauls-Platz 10 (U-Bahn U4, U5: Theresienwiese), ☎ +49 89 531547. Only during Oktoberfest: M-F 14:00-21:00, Sa-Su 12:15-21:00; no admission during services). During Oktoberfest you can access the bell tower of St. Paul's church directly north of Theresienwiese. It is kind of an insider tip, that the 97 m (318 ft) tower of St. Paul's can be climbed for one of Munich's most spectacular views. It is a gathering point for professional as well as hobby photographers, due to the postcard panorama. The tower even had its 15 minutes of fame, when in 1960 an American military plane streaked it during take-off and subsequently went down to hit a streetcar. 52 people died in the accident – 20 passengers on the plane and 32 on the ground. 48.1316711.576014 Relax at Gärtnerplatz, Gärtnerplatz (U-Bahn U1, U2, U7: Fraunhoferstraße). The circular Gärtnerplatz square is one of Munich's most impressive architectural masterpieces. During warm summer evenings, hundreds of people gather in the middle of the square itself or in one of the surrounding cafés to enjoy a few local brews and life in general. There are two supermarkets right at the square in case you forgot to bring along drinks – but keep in mind that, in Bavaria, supermarkets and other shops are closed after 20:00 and on Sundays or public holidays. 48.13100311.5756085 State Theater at Gärtnerplatz (Gärtnerplatztheater), Gärtnerplatz 3 (U-Bahn U1, U2, U7: Fraunhoferstraße), ☎ +49 89 202411. Closed until 2015 due to major construction works. The Gärtnerplatztheater is one of only three Bavarian state theaters and Munich's second opera house. It focuses mainly on opera, with occasional productions of operettas, musicals, and ballets. The opera house itself opened 1865 and was built in classical style. It has been closed for renovations and, after some delays, is expected to re-open in late 2017. 48.13694411.56256 Deutsches Theater München (German Theater Munich), Schwanthalerstraße 13 (south of Munich Central Station), ☎ +49 89 55234444. The German Theater Munich is Germany's largest theater for guest performances. The theater focuses on music hall besides productions of theater, ballet, operettas, and musicals. It was opened in 1896 and underwent several renovations since then. 48.13095211.5668477 Pink Christmas, Stephansplatz (U-Bahn U1, U2, U3, U6, U7: Sendlinger Tor). End of November until Christmas Eve: daily 16:00-21:00. A small and cozy Christmas fair organized by Munich's gay and lesbian community. The name is taken very literally: nearly everything is colored pink. There is a daily show act at 19:00. 48.1258111.574748 Frühlingsanlagen, Eduard-Schmid-Straße (Tram 17: Eduard-Schmid-Straße). Relax at the banks of the Isar in the recultivated Frühlingsanlagen and treat yourself with a cold and tasty local beer. On warm summer evenings the place is busy with people, partying at the river and enjoying life. 48.13042811.5714682 Optimal Records (Echt Optimal Schallplatten), Kolosseumstraße 6, 80469 München (U-Bahn: U1,U2 Fraunhoferstraße Rosenheimer Platz, Tram: Lines 17, 18, 27 Müllerstraße), ☎ +49 89 268185, e-mail: info@optimal-records.de. 11:00-20:00. Munich's iconic Optimal record store has been in business since 1982 and offers a well-assorted range of techno, house and electro vinyl but also reggae, soul, hip-hop, new wave and easy listening. The record store and the scene around it spawned internationally acclaimed music labels such as Disko B, International Deejay Gigolos or Sub Up as well as Munich's most famous techno club of the 1990s, Ultraschall. DJ Hell, Miss Kittin, Blake Baxter or Patrick Pulsinger have been seen here as well as Kruder & Dorfmeister, Henry Rollins or Robbie Williams. 48.13248711.5770923 Public Possession, Klenzestrasse 16, 80469 Munich (S-Bahn: Isartor, U-Bahn: U1,U2 Fraunhoferstraße), ☎ +49 89 26010425, e-mail: info@publicpossession.com. Wed-Fr 12:00-19:00. Record store and homebase to the internationally acclaimed record label of the same name. The store offers electro, techno, house and disco vinyl and is also a venue for boiler room sessions. The scene around it include artists such as the Zenker Brothers and the Blitz club. 48.12908611.5744184 Schallplattenzentrale, Fraunhoferstrasse 26, 80469 München (U-Bahn: U1,U2 Fraunhoferstraße), ☎ +49 89 20209966, e-mail: info@schallplattenzentrale.de. Large second-hand record store offering vinyl and CD's from various music genres. 48.13017211.5733971 Bergwolf (German), Fraunhoferstraße 17 (U-Bahn U1, U2, U7: Fraunhoferstraße), ☎ +49 89 23259858. M-Th 12:00-15:00 & 18:00-02:00, F 12:00-15:00 & 18:00-04:00, Sa 12:00-04:00, Su 17:00-22:00. Typical German fast-food joint. At this place you can get sausages, fries, beer, and rock music nearly all night long. Some say their Currywurst is the best in Germany, even better than those you get in Berlin. €3-€7. 48.1292211.57692 Haguruma (Japanese), Baaderstraße 62 (U-Bahn U1, U2, U7: Fraunhoferstraße), ☎ +49 89 2016911. M-Sa 12:00-15:00 & 18:00-23:30. An authentic Japanese restaurant with equally authentic food. €4.60-€12. 48.1381911.558793 Bistro Lavash, Goethestraße 7a (About half a block south of the Hauptbahnhof), ☎ +49 89 54508663. Daily, 8:00-22:00. This Turkish eatery is more than a döner place. Stuffed eggplant and zucchini are among the worthwhile dishes, though their döner is also good. They have inexpensive lunch specials and are open early and late. 48.13181711.566534 Schnelle Liebe (American & Organic), Thalkirchner Straße 12 (U-Bahn U1, U2, U3, U6, U7: Sendlinger Tor), ☎ +49 89 21578752. Daily from 17:30. A very popular burger joint direcly south of Sendlinger Tor. Tasty and huge burgers fill up the small restaurant pretty quickly nearly every night. It is definitely not the location for a quiet dinner, but a place to start your night in town with a few beers and a burger. The restaurant only serves organic food. €6.80-€9.80. 48.1304511.574215 Lotter-Leben (American & Thai), Klenzestraße 43 (U-Bahn U1, U2, U7 & Tram 17: Fraunhoferstraße), ☎ +49 89 12739127, e-mail: andi.lotter@t-online.de. M-Th 17:00-01:00, F-Sa 10:00-02:00, Su 10:00-00:00. Lotter-Leben is a combination of restaurant and bar, where you can first have your (rather delicious) burgers, followed by a couple of beers or cocktails. €8-€16. 48.1286611.569727 Faun (German), Hans-Sachs-Straße 17 (U-Bahn U1, U2, U7: Fraunhoferstraße), ☎ +49 89 263798. M-F 10:00-01:00, Sa-Su 09:00-01:00. Wonderful art nouveau ceiling from 1906. Bavarian and international cuisine at affordable prices. 48.1307611.57259 Gasthaus Fraunhofer (Bavarian), Fraunhoferstraße 9 (U-Bahn U1, U2, U7: Fraunhoferstraße), ☎ +49 89 266460. Daily 16:30-23:00 (food) - 01:00 (drinks). One of the most traditional restaurants in Munich. Splendid location; they also have a pocket theatre and studio cinema in the backyard. Bavarian brunch with live music on Sundays. Located on Fraunhoferstr, close to the metro station with the same name. This was Munich film director's Rainer Werner Fassbinder favorite restaurant. €10-20 (main course). 48.1283811.5709210 Sushi+Soul (Japanese), Klenzestraße 71 (U-Bahn U1, U2, U7: Fraunhoferstraße), ☎ +49 89 2010992. Daily from 18:00. A good Japanese restaurant with a very modern atmosphere and really good, freshly prepared sushi and sashimi. Though it is rather pricy, they offer a number of good deals to save money: bento menue 50% off 18:00-19:30, sushi 50% off M&Su from 22:00, all coctails 50% off 18:00-20:00, Japanese cocktails 50% off from 23:00. They also have a large assortment of cokctails and Japanese whiskeys. €9-€45. 48.1319111.543631 Bavariapark beer garden, Theresienhöhe 15 (U-Bahn U4, U5: Schwanthalerhöhe), ☎ +49 89 45211691, e-mail: info@wirtshaus-am-bavariapark.com. 11:00-23:00. The beer garden with 1500 seats next to Theresienwiese (the venue of Oktoberfest) is on the old trade fair grounds and was opened in 2007. The beer brand is Augustiner. Beer (1L) €6.20. 48.1261211.559492 Paulaner Bräuhaus beer garden, Kapuzinerplatz 5 (U-Bahn U3, U6: Goetheplatz), ☎ +49 89 5446110, e-mail: info@paulaner-brauhaus.com. 10:00-23:00. The beer garden with 800 seats is next to the place where Paulaner had its first brewery. The served beer is of course Paulaner. The beer garden is not that quiet, as it is next to much-used street. Beer (1L) €7.50. 48.1270111.57024 Couch Club, Klenzestraße 89 (U-Bahn U1, U2, U7, Tram 17: Fraunhoferstraße), ☎ +49 89 12555778, e-mail: info@couch-club.org. Tu-Th 19:00-01:00, F-Sa 19:00-03:00, 19:00-00:00. Guests are sitting in comfy couches or at the long bar in this cozy place. The speciality of the Couch Club are their over 100 varieties of gin and the gin tastings. 48.13224111.5791455 Hausfreund, Buttermelcherstr. 17, 80469 München (S-Bahn S1,S2,S3,S4,S6,S7,S8: Isartor), ☎ +49 89 25546800. Dinner and clubbing at house DJ Tom Novy's and DJ Ali Escobar's (Bullitt Club) new music bar and restaurant. 48.1298211.570436 Hoover & Floyd, Ickstattstraße 2 (Tram 16, 17, 18: Müllerstraße), ☎ +49 89 26949015. M-Th 09:00-01:00, F-Sa 10:00-open end, Su 10:00-23:00. If the neighbouring Lola (see below) is full or if you prefer a quieter surrounding, the Hoover & Floyd is a very good second choice. The place is also a café during daytime. Beer (0.5L) €3.50, Long drinks €7.50. 48.13076911.5700047 Ksar Barclub, Müllerstraße 31, 80469 München (U-Bahn U1, U2, U7, Tram 17: Fraunhoferstraße), ☎ +49 89 55 298 479, e-mail: info@ksar-barclub.com. 20:00-open end. Fashionable bar with live DJs (electro, house, hip-hop). 48.1297211.570588 Lola, Ickstattstraße 2a (Tram 16, 17, 18: Müllerstraße), ☎ +49 176 24000083. W-Sa 20:00-03:00. This place is real favourite bar material. Not too big with discarded cinema chairs and red baroque couches in the corners, this bar likes to convey a profligate image. It's almost always full on weekends, so don't get there too late. If you do, though, and the door is already closed you can always try the Hoover & Floyd (see above) next door. Beer €3.20, Long drinks €8. 48.1301111.567689 München 72, Holzstraße 16 (U-Bahn & Tram: Sendlinger Tor), ☎ +49 89 97343785, e-mail: buero@muenchen72.de. M-Th 16:30-01:00, F 16:30-03:00, Sa 10:00-03:00, Su 10:00-22:00. This comfy café/bar had to move here from its old location some 500 metres to the north because of gentrification. The interior seems to be coming straight from the 70s as the whole place is a big homage to Munich's 1972 Summer Olympics. Beer (0.5L) €3.20, Long drinks €7.50. 48.1302611.5782710 Netzer & Overath, Baaderstraße 33 (U-Bahn U1, U2, U7, Tram 17: Fraunhoferstraße), ☎ +49 89 13927970, e-mail: info@netzer-overath.de. Th 20:00-03:00, F-Sa 20:00-04:00 (or later). The casual atmosphere of this bar always conveys the feeling of being at a private house party, where you instantly feel welcome and as one of the regulars. Netzer & Overath are actually two separate venues, connected by only a door - the loud and clubby Netzer and the quieter bar Overath. Beer (0.5L) €3.30, Long drinks €7.50. 48.1326711.577411 Niederlassung, Buttermelcherstraße 6 (Tram 16, 18: Reichenbachstraße), ☎ +49 89 32600307. Tu-Th 19:00-01:00, F-Sa 19:00-03:00, Su 19:00-00:00, Closed Mondays. A cozy bar, which can get pretty crowded from Thursday to Saturday. The bar focuses on Gin (over 70 varieties) and features a different special beer every month (in addition to their normal selection of beers). Every Sunday evening there is a public broadcast of the recent episode of the most German of crime television series, Tatort. Beer (0.5L) €3.10, Cokctails €7.50. 48.1319611.5754612 Robinson Kuhlmann, Corneliusstraße 14 (Tram 16, 18: Reichenbachplatz), e-mail: robinson@robinsonkuhlmann.com. Su-W 19:00-03:00, Th 19:00-04:00, F-Sa 19:00-05:00. "We don't get drunk, we get awesome." Well, you shouldn't take the bar's slogan too seriously - you might not get awesome, but you most probably get drunk here (or already are when you strand here). This small bar with an all-black interior and its huge front windows right next to Gärtnerplatz became one of the most popular hangouts for the locals, not only because of some of the longest opening hours (in Munich terms). 48.1288811.5764213 Zephyr Bar, Baaderstraße 68 (U-Bahn U1, U2, U7 & Tram 17: Fraunhoferstraße), e-mail: info@zephyr-bar.de. M-Th 20:00-01:00, F-Sa 20:00-03:00. This very plain bar is only noticeable as a worthwhile drinking venue because of the crowd that gathers in front of it literally every day. Despite its modest appearance, the Zephyr Bar is one of the best cocktail bars in Munich with an award-winning cocktail mixer behind the counter, though. Since the quality and creativity of the served drinks is high, the prices are also high. Cocktails €10, Long drinks €8.50. 48.13986311.56299114 8 Below, Schützenstraße 8, 80335 München (S1,S2,S3,S4,S6,S7,S8, U4,U5: Karlsplatz (Stachus)), ☎ +49 89 402 685 71, e-mail: feiern@8below.de. Live music club, disco and 90s music. 48.1349811.5650815 8Seasons, Sonnenstraße 26 (U-Bahn U1, U2, U3, U6, U7: Sendlinger Tor), ☎ +49 176 23232323. F-Sa 22:00-06:00, Tu 18:00-03:00. Exclusive club with the usual party crowd. Dress to impress is generally the motto. 48.12210411.55478116 Bahnwärter Thiel, Viehhof, Tumblingerstraße 29, 80333 München (U-Bahn U3, U6: Goetheplatz, Poccistraße), ☎ +49-89-452 150 63, e-mail: info@bahnwaerterthiel.de. This techno club is located at the graffiti-covered former Viehbahnhof goods station and resides within a pile of ship containers from the Port of Hamburg. Very popular is also the outdoor area with its free "Bahnsteig" afternoon raves where the DJ resides within the cab of a decommissioned subway car. On the other side of the rail tracks, accessible via the Tumblingerstraße car tunnel, you can also find the party ship Alte Utting, which is also run by the Bahnwärter Thiel crew. 48.13138711.58561717 BLITZ Club, Museumsinsel 1 / via Ludwigsbrücke, 80538 München (S1,S2,S3,S4,S6,S7,S8: Isartor, Rosenheimer Platz), ☎ +49 89 380126561, e-mail: kontakt@blitz.club. F-Sa 23:00. New minimal techno club at an impressive historic location, a former congress hall on the Museumsinsel island. The club has been covered intensely by nation-wide media recently. The venue also features a separate restaurant which also opens weekdays. 48.13644611.56427718 Cord, Sonnenstraße 18, 80336 München (Karlsplatz (Stachus)), e-mail: info@cord.tv. Live music club in the city center. 48.13382811.56514919 Corleone, Sendlinger-Tor-Platz 7, access via Pettenkoferstraße, 80336 München (U1,U2,U3,U6,U7,U8: Sendlinger Tor), e-mail: mail@corleone.cc. Tiny art bar turning into an electro club at night. 48.13759811.56438620 Harry Klein Club, Sonnenstraße 8, 80331 München (S1,S2,S3,S4,S6,S7,S8, U4,U5: Karlsplatz (Stachus)), ☎ +49 89 40287400, e-mail: info@harrykleinclub.de. 23:00. The techno club Harry Klein is one of the two inofficial successors of the legendary Ultraschall club (1994–2003). It has repeatedly been awarded by reputable magazines of the electronic dance music scene (23rd best club worldwide by DJ Mag, third best club in Germany by De:Bug). It is also famous for its live visuals. 48.13756311.56382421 Grinsekatze Club, Schwanthalerstraße 2, 80336 München (S1,S2,S3,S4,S6,S7,S8, U4,U5: Karlsplatz (Stachus)), ☎ +49 176 31324882, e-mail: nedim@grinsekatzederclub.de. Fridays 23:00. The techno club Grinsekatze (cheshire cat) is known for electro and minimal techno, and a close-knit scene of ravers revealing themselves by cat tattoos. It is the successor of the same-named former club at the now demolished Optimolwerke. 48.1289211.5679322 Milla Club, Holzstraße 28 (U-Bahn U1, U2, U7 & Tram 17: Fraunhoferstraße), ☎ +49 89 18923101. Su-Th 20:30-02:00, F-Sa 20:30-04:00. You have to hold on to your drink in this club - not only because of the (almost) daily live performances of predominantly local bands, but especially due to the oblique floor. Guests are sitting on worn out couches or wooden chairs in this narrow but long club. Entry (live acts): ~€12 (free after 23:00),. 48.12486111.54887423 Strom, Lindwurmstraße 88 (U-Bahn: U3,U6 Poccistraße, Bus:62,N40,N42), ☎ +49 89 24205711, e-mail: office@strom-muc.com. 22pm. Dirty alternative club in the depot basement of an old business house with a focus on indie rock and post-punk concerts but also some electro club nights. 48.1247311.5506724 Substanz, Ruppertstraße 28 (U-Bahn U3, U6: Poccistraße), ☎ +49 89 7212749, e-mail: info@substanz-club.de. Su-Tu 20:00-01:00, W-Th 20:00-02:00, F-Sa 20:00-03:00. This live club hosts local and international indie bands every other day (from 20:00-22:00). Afterwards and on all other days you will hear house or hip-hop tunes as well, though, depending on the DJ booking of the day. Football games of the two local clubs Bayern Munich and 1860 Munich are also regularly shown. The crowd is generally well in their twenties and the drink of choice is beer. Entry (live acts) ~€7,. 48.12375611.55627925 Wannda Circus, Viehhof, Tumblingerstraße 29, 80333 München (U-Bahn U3, U6: Goetheplatz, Poccistraße), ☎ +49-089-45215063. At this regularly moving venue within a circus tent you will find techno club nights, indie rock concerts or wild fashion shows. Ludwigvorstadt features a dense grouping of hotels in the quarter immediately south of the Hauptbahnhof, between the station and Theresienwiese - almost every other building there hosts a hotel. You can choose between properties of different standards and price levels. 48.13857611.5601652 Euro Youth Hostel, Senefelderstraße 5 (100 m south of Munich Central Station), ☎ +49 89 59908811. Rooms and facilities are well maintained and staff are friendly and attentive. Very good location. Lively Bar and free wi-fi in all areas. starting from €11. 48.13862711.5603224 Munich Jaeger's, Senefelderstraße 3 (100 m south of Munich Central Station), ☎ +49 89 555281. Jaeger's is one of many youth hostels in that street. It features clean and comfortable lodgings, with a simple breakfast served each day - a great place to meet other travelers. starting from €12. 48.13906311.5602735 Wombats City Hostel Munich, Senefelderstraße 1 (directly south of Munich Central Station), ☎ +49 89 59989180. Check-in: 14:00, check-out: 10:00. Social hostel that is centrally located. It offers an all-you-can-eat breakfast, internet terminals, laundromats, 24hr reception service and no curfew. It also has a nice bar with a pool table and cheap drinks. Even some locals come here just for the bar. starting from €12. 48.1369811.56087 Hotel Astor, Schillerstraße 24 (100 m south of Munich Central Station), ☎ +49 89 54837. This 4 star hotel takes care of the details, such as offering a free internet station in the lobby, free bicycle hire and an Italian bistro serving homemade culinary delights. A cozy lounge is available for smokers, and wireless internet access is available in all rooms at no extra charge. Double from €99. 48.1372611.559568 Courtyard by Marriott Munich City Center, Schwanthaler Strasse 37. A typical Courtyard property in the dense quarter immediately south of the Hauptbahnhof. 48.1388611.5610710 Hotelissimo Haberstock Swiss Quality Hotel, Schillerstraße 4 (directly south of Munich Central Station), fax: +49 89 5503634. The hotel was completely renovated in 2003 and is located 200m from Munich Central Station and 300m from the city center. Double from €104. 48.1375711.5614811 Hotel Präsident, Schwanthalerstraße 20 (100 m south of Munich Central Station), ☎ +49 89 5490060. Pleasant 3-star hotel that offers a charming ambiance, business travel facilities, and Munich tour packages. Double from €97. 48.1377511.5612412 Hotel Royal, Schillerstraße 11 (100 m south of Munich Central Station), ☎ +49 89 59988160. Check-in: 14:00, check-out: 11:00. The hotel offers free wireless internet access and free premiere movie channel (German & English). It features a very central location with only a few minutes to walk from Munich's historic center, Marienplatz, Hofbräuhaus and the Oktoberfest site. Double from €89. 48.1375511.5633513 Hotel Wallis, Schwanthalerstraße 8 (200 m south of Munich Central Station), ☎ +49 89 5490290. Don't let the austere facade fool you, Hotel Wallis is quite charming inside, with free wireless internet access. Although the bedrooms are small, they are furnished in a toned down Alpine-village style. Wireless internet is free for one device, and €5 per day for each additional device. Double from €93. 48.139511.5593914 InterCityHotel Munich, Bayerstraße 10 (connected to Munich Central Station), ☎ +49 89 444440, fax: +49 (089) 44 44 4-599. Good value for money at a great location. Rooms are small but simple, but the easy access to the train station is convenient. €77-265. 48.1380411.5602615 Mercure München City Center, Senefelderstraße 9. Draped in shades of red, the Mercure provides a rather good experience compared with the chain's average, if you can live with the orange-tiled bathrooms. 48.1361311.5555916 Tryp München City Center, Paul-Heyse-Strasse 24. One of the older-style Tryp hotels, which does the job but can hardly impress. Unlike most other Tryp hotels, this one does not offer family rooms. 48.1396211.5645817 Hotel Königshof, Karlsplatz 25 (S-Bahn & U-Bahn: Karlsplatz (Stachus)), ☎ +49 89 551360. The luxury hotel is at Karlsplatz (Stachus). Aside from the spacious rooms, hotel guests can expect a champagne breakfast in the gourmet restaurant, Königshof, awarded a Michelin star. Double from €312. 48.1394211.5638118 anna hotel, Schützenstraße 1 (S-Bahn & U-Bahn: Karlsplatz (Stachus)), ☎ +49 89 599940. This design hotel is located right between Munich's central station and Karlsplatz (Stachus) square. The bar and restaurant at the anna hotel has become a hot spot for hotel guests and locals alike. Double from €220. 48.1398111.562219 Hotel Excelsior, Schützenstraße 11 (S-Bahn & U-Bahn: Karlsplatz (Stachus)), ☎ +49 89 551370. The first class hotel is centrally located, only 200 m (220 yd) from the central station and only a 10 min walk through the pedestrian zone to the Marienplatz. The breakfast is offered as a buffet and does not leave anything to be desired. Free wireless internet access is provided. Double from €220. 48.1390311.558220 Le Meridien Munich, Bayerstraße 41 (across the street from Munich Central Station), ☎ +49 89 24220, fax: +49 (089) 2422 2025. Le Meridien has all of the old-world flair one expects from a charming European hotel, combined with modern amenities. High speed internet access and sleek conference rooms for business meetings provide an elegant atmosphere for corporate events. €150-615. 48.1394111.5573521 Sofitel Munich Bayerpost, Bayerstrasse 12. The Sofitel is immediately adjacent to the Hbf main hall and opposite the Le Meridien. Despite a historic facade, it maintains a very contemporary ambiance. 48.130111.58371 M-WLAN wifi hotspot Deutsches Museum, Museumsinsel. The city of Munich provides free wifi hotspots at some of the major tourist spots around the city. free. 48.1396911.558572 Starbucks Coffee House Munich Central Station, Bayerstraße 10a (within Munich Central Station), ☎ +49 89 51114743. Daily 06:00-23:00. The central station franchise of the famous Seattle based coffee house chain. It provides free wireless internet access. 48.1398911.562843 Starbucks Coffee House Schützenstraße, Schützenstraße 8 (100 m east of Munich Central Station), ☎ +49 89 51555497. Daily 07:00-20:30. This franchise of the famous Seattle based coffee house chain is located within the pedestrian area between Munich Central Station and Karlsplatz (Stachus). It provides free wireless internet access. This district travel guide to Ludwigsvorstadt-Isarvorstadt has guide status. It has a variety of good, quality information including hotels, restaurants, attractions and arrival info. Please contribute and help us make it a star! This travel guide page was last edited at 00:40, on 25 February 2019 by Wikivoyage user Rio65trio. Based on work by Wikivoyage users Ikan Kekek, Traveler100bot, ShakespeareFan00, Grahamsands, Macgyverjoel, ThunderingTyphoons!, Qui1che and AndreeBot, Wikivoyage anonymous user 73.162.113.11 and others.